Died 5th November 2018 (suddenly) in hospital. Late of 22 Auster Park, Newtownards. Dearly loved husband of Lily, much loved father of Mary, Sarah, Liz, Sam and Kate, a much loved grandfather and great grandfather. Funeral service will be held on Friday 9th November at 1:00pm in his home, followed by committal in Movilla Cemetery. Family flowers only please. 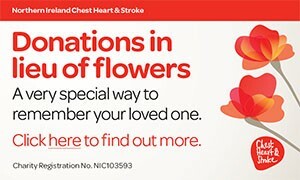 Donations in lieu if desired to NI Chest, Heart and Stroke (cheques only please made payable to the above charity) - c/o. Willowfield Private Funeral Home, 440 Woodstock Road, Cregagh BT6 9DR. I never could have said goodbye to one I love so well. Sadly missed by his nephew Bill and the Love family circle. Very deeply regretted by his sister Peggy, nieces Catherine and Joan and nephews Walter and Don. I am sorry to tell you that Samuel (Sammy) HOY has passed away.